As the Seahawks prepared to gather for the first time as a team Monday since the end of the 2018 season, uncertainty continued to loom over two of their biggest-name players — quarterback Russell Wilson and defensive lineman Frank Clark. 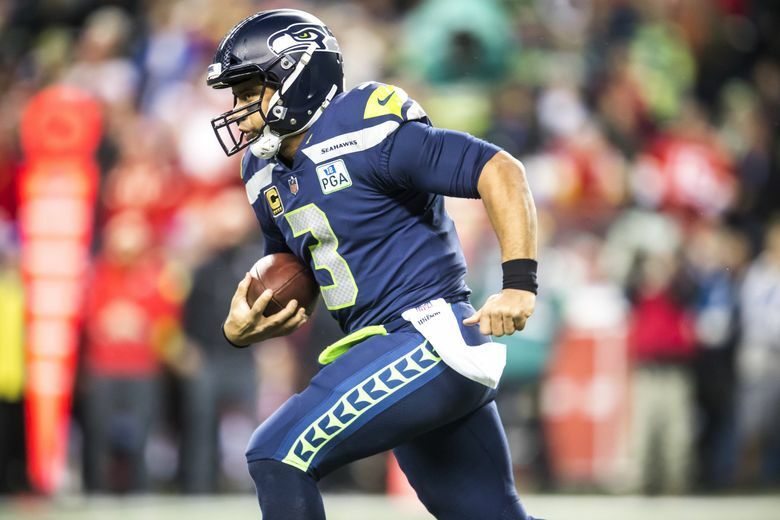 Wilson set a deadline of Monday a tmidnight to sign a new contract with the Seahawks, and while there were reports over the weekend that the two sides had ramped up negotiations. But as of Monday at noon, it was not clear if anything was imminent, though the two sides were known to be talking — Ian Rapoport of the NFL Network reported that Wilson’s agent, Mark Rodgers, had been in Seattle all weekend talking with the Seahawks. As for Clark, he has yet to sign his franchise tag for the 2019 season and the Seahawks are known to be exploring all options, including listening to trade offers. Sunday night, Pro Football Talk reported via Twitter there was “some chatter on the league grapevine tonight about a possible Frank Clark trade.’’ But as of early Sunday evening, there were no definitive reports of a trade. Some observers wondered Sunday night after PFT’s report on Clark if that meant the Seahawks are closer to a deal with Wilson, the idea being they have decided not to re-sign Clark to free up money for Wilson. But Seattle also might just be reluctant to give Clark a contract that realistically would likely have to make him the third-highest paid defensive player in the NFL after only Khalil Mack of the Chicago Bears and Aaron Donald of the Los Angeles Rams. Seattle has ample cap space in seasons 2020 and beyond. But that’s due in part to not having many of its key players under contract for significant periods of time. At the moment, Seattle has three players not on standard rookie deals under contract beyond the 2020 season — left tackle Duane Brown, receiver Tyler Lockett and kicker Jason Myers. Whether the Seahawks have just been saving up to pay the likes of Wilson, Clark, Wagner and Reed — or may be playing it a little more cautiously in the wake of the roster turnover a year ago — remains in question. Of the few reports that talks between Wilson and the Seahawks were heating up, the most definitive came from Jake Heaps, who was on the Seattle practice squad and offseason roster as a backup to Wilson for parts of two seasons and now helps run Wilson’s youth-quarterback academy. Heaps tweeted late Saturday afternoon that Wilson’s agent, Rodgers, and Schneider “have been meeting for several hours the past couple days” and, “hopefully there’ll be great news for all Seahawks fans if they can lock up” Wilson. There were no further reports as of Sunday evening of any progress, however, though there continued to be rumors about his future. Wilson set Monday as a deadline to get a new contract since it is the beginning of the offseason workout program. But while Wilson set a deadline, the Seahawks don’t necessarily have to abide by it, knowing Wilson is under contract for the 2019 season and they can use the franchise tags in 2020 and 2021 for what would be expensive contracts, but deals it could handle reasonably enough, to keep him in place, if needed. The Seahawks, though, are likely hoping they can again get a contract done with Wilson just as a deadline is set to run out. Wilson set a similar deadline in 2015 of getting a contract completed by the time training camp started, and the contract was announced on the day camp opened.